ocaholic - Graphics cards Should I Upgrade? 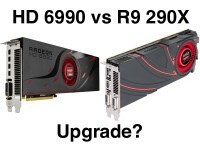 > Radeon HD 6990 vs R9 290X - Should I upgrade? Category : Should I Upgrade? A gamer simply can't get enough graphics power in their rig, which makes the upgrade question omnipresent. To show you whether it makes sense to upgrade from one generation to another we created this series of articles, where we will compare graphics cards from different generations. Today we're having a close look at the differences between the HD 6990 and the R9 290X. Comparing the Radeon R9 290X with the Radeon HD 6990 shows that the new single GPU card is actually quicker than the old high-end dual GPU model. Looking at the results a bit closer shows, that the R9 290X is on average about 31 percent faster than the Radeon HD 6990, when it comes to ingame performance. The biggest performance differences can be found with Metro Last Light. In this case, frame rates are about 68 percent higher on a Radeon R9 290X. On the other side there is the Crysis 3, where the R9 290X is only 1 percent quicker. At this point we also want to have a closer look at power consumption too. If we equip our test system with a Radeon HD 6990 we see that it pulls 80 Watt from the plug, whereas the same setup with a R9 290X only needs 57 Watt. Under load conditions there is also a rather big difference between the two cards. Once we plugged the Radeon HD 6990 card into the test system power consumption goes up to 481 Watt and with the R9 290X power consumption is at 425 Watt. In absolute numbers the R9 290X certainly need less power but it's still astonishing to see how much power this single GPU card is able to burn away. Between the Radeon R9 290X and the HD 6990 there is a 31 percent performance gap. If you keep in mind that in certain games we measured differences as high as 68 percent, then we can definitely recommend this upgrade. Other than that power consumption of the R9 290X is lower than what you got from the HD 6990. Should you be thinking about upgrading from a Radeon HD 6990 to a R9 290X, then then you might be happy to hear, that HD 6990 card still go for about 250 Euro on eBay - thanks to the ongoing mining craze. This means that you get more than half the money you need for a brand new R9 290X from your old card.